Classic 'clocking' or darts make this collar historically accurate in construction. 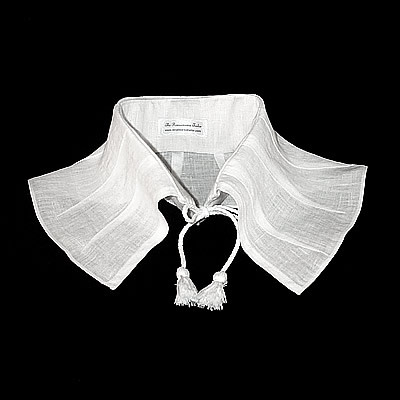 100% linen collar and neck band. Machine washable, drip dry. Available in White linen. Made in Black linen by special request only. Our Online Store will close May 15th, 2019. We will still take commissions on a case-by-case basis. If you have any questions, please don't hesitate to email us! 13.5" 14" 14.5" 15" 15.5" 16" 16.5" 17" 17.5" 18"
Don't see your neck or wrist size listed? Note your actual size in the 'notes' section during check-out, and we'll take care of the rest. 6.5" 7" 7.5" 8" 8.5 9"
3" 3.5" 4" 4.5" 5" 5.5"
If you need more information or assistance with ordering, please let us know! Got a Commission? Get a Quote! 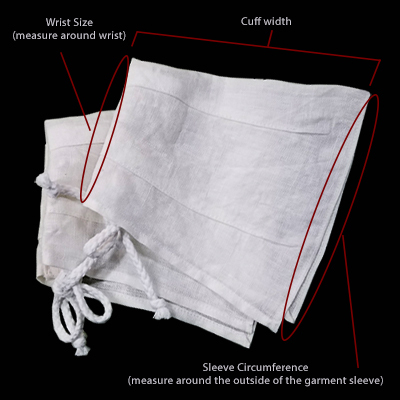 The Renaissance Tailor has been in business and online since February 2002. In that time, we've made hundreds of ruffs, cuffs, and collars. We're proud of our products and stand behind them 100%. If, for any reason, you are not satisfied with your item, let us know and we'll work to make it right.